Homage to Rembrandt. 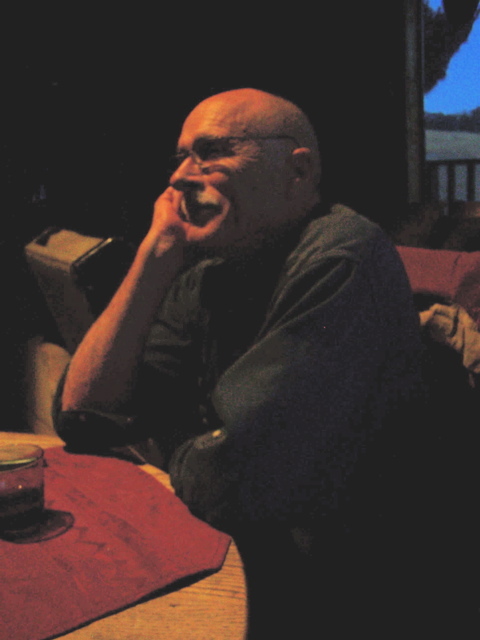 Former Inverness resident John Robbins, who built the Horizon Cable system in West Marin, at my dining-room table Wednesday just before sunset. Not much news here from this past week — just a few stories and mostly unrelated photos. The first story occurred — appropriately enough — after dark on Friday the 13th. I glanced over at the far curb just in time to see a pre-teen girl collapsing on the pavement. I immediately stopped, as did the oncoming driver that hit her. The girl was apparently leaving an event at the Marin Art and Garden Center, and parents who had been at the center, along with a policeman, immediately converged on the scene. “You were hit by a car,” the officer repeatedly explained. Within minutes, paramedics and an ambulance arrived. I later called the Ross Police Department to relate what Kathy and I had witnessed. Kathy had seen two girls in the road, jaywalking in the dark. One “retreated” to the curb when she saw the oncoming car. The other girl, however, tried to run across the street. If she’d been a second or two faster, the oncoming driver probably wouldn’t have struck her, but I probably would have. Our cars were virtually side by side when the accident occurred. The policeman I talked with said the girls’ view of oncoming traffic had been momentarily obscured by a third car, which was turning left. Fortunately, he noted, the oncoming driver was able to swerve just enough to avoid hitting the girl head-on, so her injuries were not too severe. Nonetheless, the incident left me shaken. I pass all this along for the obvious moral: don’t jaywalk on a busy boulevard after dark, and if you’re a driver, keep your eyes peeled for those that do. 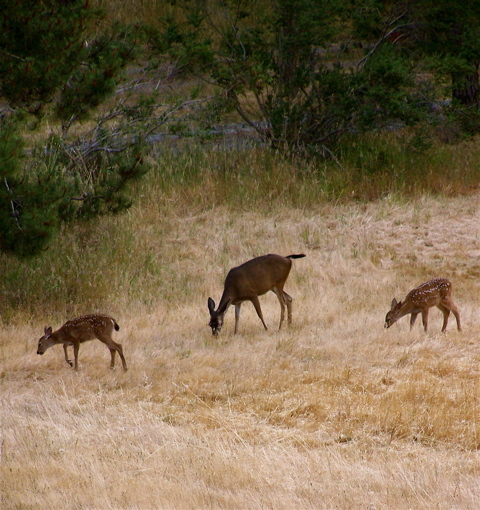 The blacktail doe and two fawns that live on this hill spend part of every day in my pasture. 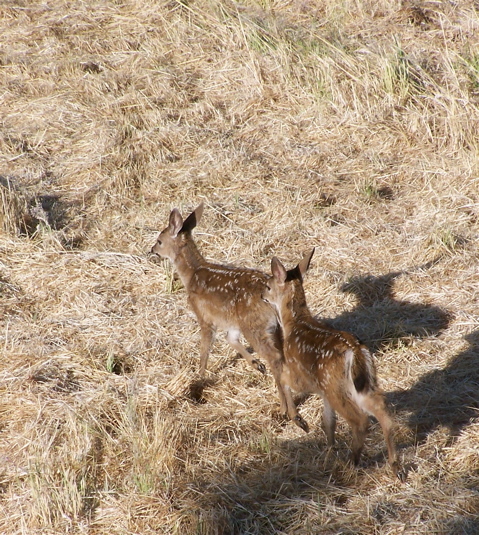 The fawns are now about 10 weeks old. I shot this family photo Thursday. My next story isn’t grim despite its violent conclusion. 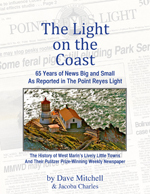 As it happens, when I sold The Point Reyes Light 32 months ago, I had been storing two of the newspaper’s old computers in my basement. They were obsolete and ready for recycling, but I didn’t want to throw them out until the hard drives were erased. In these days of identity theft and cyber-crime, leaving personal and business records on the hard drives would seem to be asking for trouble. On Monday, using the computers’ “erase” function, I tried to write over the hard drives with zeroes — the usual way to clear a hard drive. But the old software soon froze. What to do? I called Sheila and Michael Castelli, who a few years ago moved from Point Reyes Station to Taos. She builds websites, and he’s a computer techie. Mike gave me advice for resuming the erasing, but Sheila soon emailed me that Mike had come up with a simpler, low-tech solution: take out the hard drives and smash ‘em. The only problem with that was I’d never tried to disassemble a computer and wouldn’t know a hard drive if I saw one. So I wrote back for more advice. On Tuesday, however, it occurred to me to call Marin Mac Shop in San Rafael, where a techie told me he’d remove both hard drives for a total of $49.50. I crammed the two computers, two monitors (one of them huge), a plate burner, and other gear into my Acura and — with its rear end sagging — drove over the hill. Marin Mac Shop needed less than five minutes to remove both hard drives, and I was back out the door and on my way to ReNew Computers. The electronics-recycling center is hard to find. It’s located at 1241 Andersen Drive, Suite J, a small space in one of the non-descript industrial buildings south of downtown; however, the staff was friendly, and the dropoff was free. Back at home, I followed Mike’s suggestion and destroyed the hard drives with an ax. I pass all this along as one solution to the vexing problem of what to do with old computers. This last story is a pretty good indication of how I live these days. My long-term houseguest Linda Petersen has a 15-year-old dog, a Havanese named Sebastian. As I’ve noted before, he’s virtually deaf and legally blind, but he’s very sweet. In recent months, unfortunately, Sebastian has taken to begging at the table, and given his advanced age, neither of us has had the heart to turn him down. My dining-room table sits next to a window, and just outside the window is a woodbox. Linda and I were eating dinner Thursday night when her little dog as usual came over and stood with his front paws on my leg, wanting to be fed. At that moment, Mrs. Raccoon climbed onto the woodbox and began vulching over my shoulder, hoping I’d throw her some pieces of bread. “Only in this cabin,” I said to Linda, would we have a pet dog and a wild raccoon begging at the dinner table simultaneously.” Linda then took over feeding table scraps to Sebastian while I got up and threw some bread out the kitchen door to Mrs. Raccoon. I pass all this along as a warning as to what can happen once you start feeding dogs and raccoons from the dinner table. They give you no peace. Sparsely Sage and Timely is powered by	WordPress 4.9.10 and delivered to you in 0.282 seconds using 50 queries.